Keep up to date with our Teach-Yourself Series – condensed articles on migration issues in South Africa. Our articles and infographics aim to spread awareness on South Africa’s migration landscape, and our standpoints on the issue. This is a joint initiative between The Scalabrini Centre of Cape Town and Sonke Gender Justice and Lawyers for Human Rights. The first four topics in this series are: the Refugee Amendment Act, the White Paper on International Migration, birth registration and health care access. The Refugees Amendment Act, which was signed into law on 14 December 2017, can only be implemented once the Draft Regulations are finalised and published in the Government Gazette. At this time, it is still unclear when the Amendment Act will go into force – if at all. As with any law in South Africa, public involvement is part of the process. 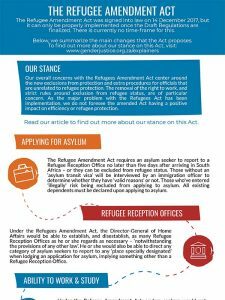 The Advocacy Programme at the Scalabrini Centre of Cape Town has provided the South African government with submissions on the Refugee Amendment Bill and comments on the Draft Regulations to the Refugees Amendment Act. In short, we are concerned that, by creating fundamental changes, this Act would infringe on the constitutional rights of asylum seekers and refugees in South Africa. 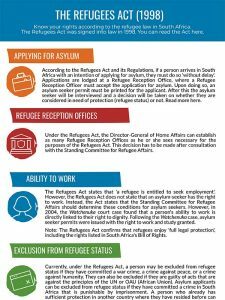 The Refugees Amendment Act is being enacted at a time of change in South African migration policy. the White Paper on International Migration for South Africa sets out a general blueprint for future migration policies, plans to add severe restrictions the refugee system (read more about it here). In this way, the Refugee Amendment Act seems to be ‘laying the groundwork’ for such changes.